Just a few flowery and foliar highlights from southeastern Pennsylvania this month. 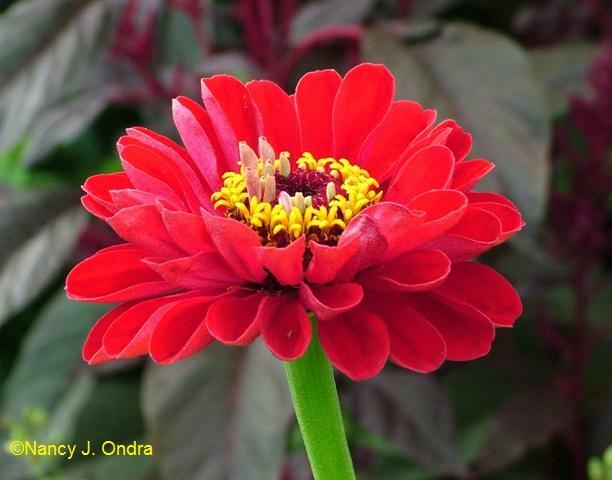 Above, a zinnia from the ‘Hot Crayon Colors’ seed blend from Renee’s Garden Seeds. I finally got red-leaved rice (Oryza sativa ‘Red Dragon’) going this year! One advantage of the extra-wet weather, I guess. I can’t wait to see it in seed. Here’s ‘Haight Ashbury’ hibiscus (Hibiscus acetosella) with the foliage of pink polka-dot plant (Hypoestes phyllostachya ‘Splash Select Pink’) and widow’s tears (Tinantia erecta). 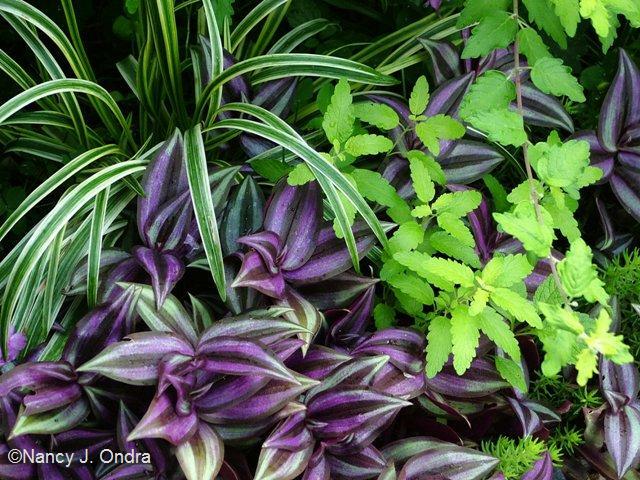 And last, Tradescantia zebrina with variegated liriope (Liriope muscari ‘Variegata’), and a seedling of Sunshine Blue caryopteris (Caryopteris incana ‘Jason’). For a tour of more August gardens all over the world, visit the Garden Bloggers’ Bloom Day link list at May Dreams Gardens. Your combinations are worth stealing. I especially like the Lonicera/Rudbeckia photo. I grow the Honeysuckle, but down here it scalds in sun and prefers more shade than the Rudbeckia would probably like. Happy bloom day! Thanks, Les. That’s a purely accidental combo, because ‘Henry Eilers’ easily reaches 7 feet tall here and the ‘Bagessen’s Gold’ is barely 7 inches tall. Henry does like to sprawl, though. On the plus side, he provides perfect summer afternoon shade to prevent the honeysuckle from scorching. This post shows that no one is better qualified to expound and instruct on Perennial Care. I just got a copy of your new book, The Perennial Care Manual and while I haven’t gotten any further than your warning about invasive plants, I can see it is going to be a huge help. 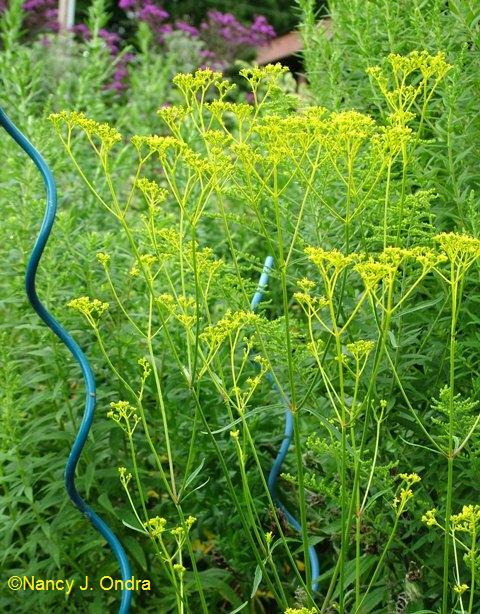 I’ve got a photo of Tansy on my GBBD post – with a warning about how invasive it is. So kind of you to say that, Pat. I hope you find the book helpful. I’ll have to read about your experience with tansy; I know it really can be an aggressive spreader. 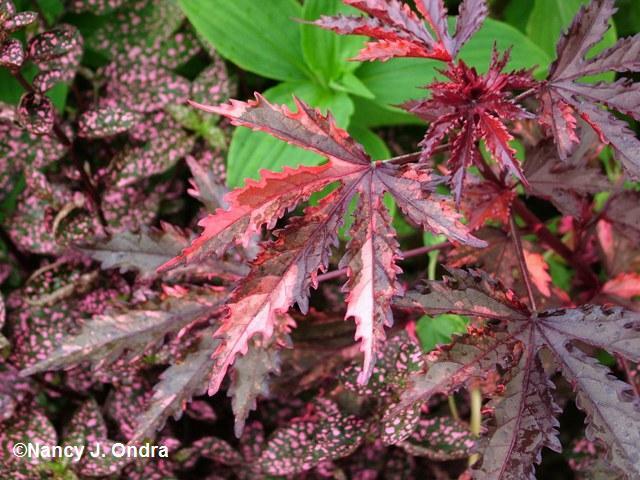 Love that red leaved rice and Fine Wine weigela-never seen either of those. Going to check those for Zone 9 now LOL. I’m not sure how much heat the weigelas can take, Nicole, but I have a feeling that the rice might do quite well for you. Finding the seed can be tricky, though; I usually score some through our Hardy Plant Society Seed Exchange because I’ve never gotten it to even this size before, let alone flowering and seed. You have some spectacular combinations. 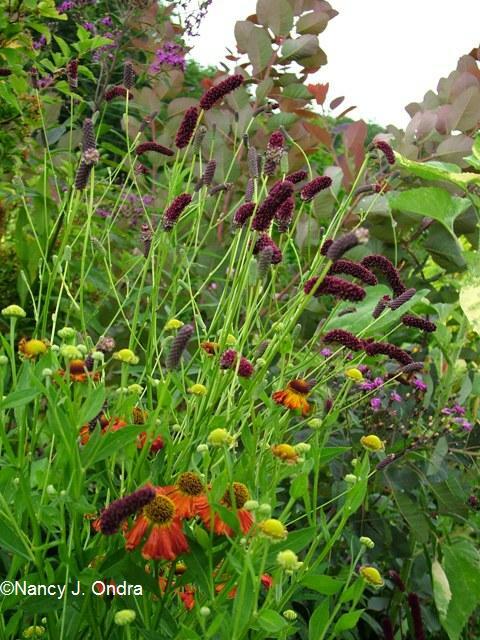 And that image of the Sanguisorba makes me wonder why I am not growing it. Same with that Hibiscus; usually not my favorite plant but that foliage is amazing. Thanks, Linda! Yes, you really need to try a few sanguisorbas. You can get some great ones from Digging Dog Nursery. Two pieces of advice: Be prepared to give them a few years to settle in and do their thing; then they just keep getting better as they age. Also, plant them behind or close to a twiggy shrub that will prop them up, because they tend to get top-heavy when they bloom. It’s pretty to see them lean gracefully but sad when they’re face-first in the mud. Linking stakes are ok for a short-term fix. I love your plant combos, especially the ‘Haight Ashbury’ hibiscus with the polka dot plant – it’s perfect in color & form. 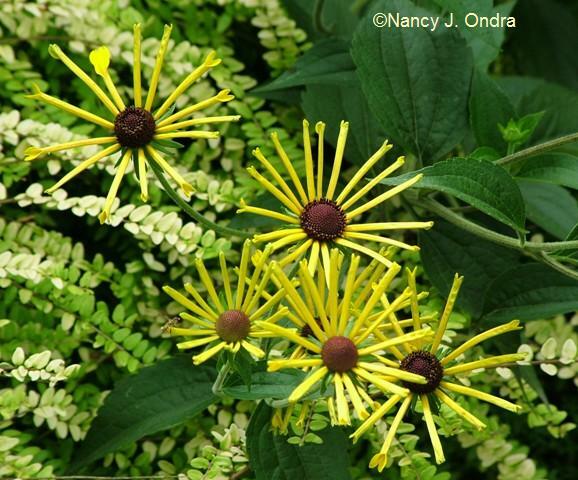 When I first started seeing pictures of Rudbeckia ‘Henry Eilers,’ I thought I hated it, but now that I’ve seen it in person, I really like it. I’ve also become smitten with Sanguisorba. 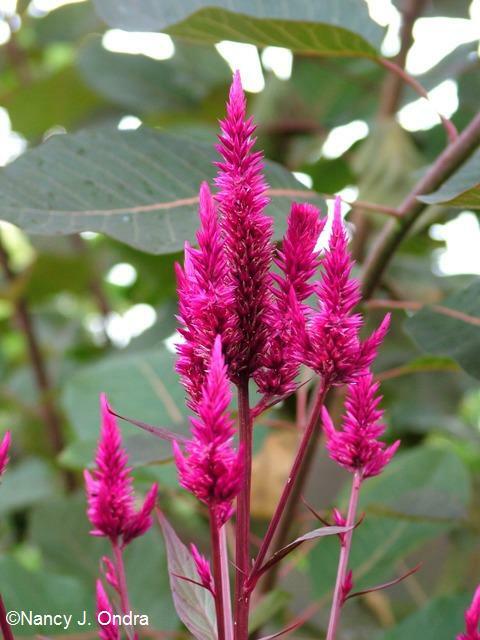 Your hybrid Celosia is stunning, with those fantastic fuschia stems. I’m still getting used to ‘Henry Eilers’. I like him in pictures, but he’s a challenge in the garden. He needs to be relatively close to the edge so you can see his flowers, but he’s so lanky and sprawly that he ends up in the pathway. Next year I’m going to include him in the early June cut-back extravaganza to make him bushier and sturdier. I really like that coreopsis (Limerock dream), I must see if I can find some. Coreopsis does really well here, and I’m searching for more cultivars for the new stroll garden. See, if you didn’t keep track of what it was, I wouldn’t know what to look for, would I? Thanks! We actually did a Design Workshop on Labeling and Record-Keeping back in January at Gardening Gone Wild. For me, the biggest help has been taking lots of pictures of everything over the last eight years here. At least once a year, I go through the backlog of images to label them with the plant names, and that’s been a big help in reminding who is who! And yes, that ‘Limerock Dream’ coreopsis is one of my favorites. It’s not hardy – in Zone 6, anyway, as far as I know – but it’s worth every penny as an annual. I found that post all on my own earlier to day before I came over here to check you out some more, but thanks for the link., and I think I may be one of the gardeners that just gives up. I followed one of the links and the gardener wisely suggested that you take your notebook out into the garden with you so you can take notes while you plant. I did that for the bulb border I wrote about earlier, and it worked really well. It’s just trying to remember to do it that is hard. I may get that Limerock Coreopsis as an annual then. You never know. A lot of my semi-hardy things do well on south slopes with the rocks to keep them warm. 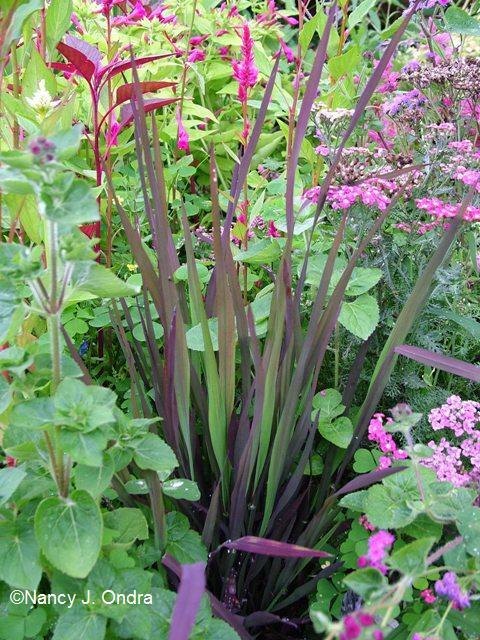 Anyway, a small perennial isn’t that expensive. I waver between wanting to remember all of my plants’ names and not really caring, as long as they look good. I think blogging has gotten me back to the “wanting to know” side, at least for a while, so I can write about the really cool ones. What unusual flowers you have. I was wondering if you have an irrigation system? I have tried growing some of those fancy annuals and have had terrible luck with them. I don’t get out and water much. I just wonder if that isn’t the reason why I don’t have much luck or if it is just a combination of things. We certainly haven’t needed irrigation of any sort this year! But even in “normal” years, I stop watering around late May or early June; after that, I’d spot-water (by hand) only if it’s hot and dry for more than 10-14 days. Most of the annuals here are self-sowers, and I figure they’re adapted to just about anything. Neat stuff Nan! Is your ‘Limerock Dream’ new this year or returning from last? I added one this year and was curious about its hardiness. I’ve seen various reports that don’t seem very consistent. The ‘Sylphid’ plumed celosia looks pretty nice too. Oh yes, I remember your post about getting a ‘Limerock Dream’ this summer, Dave. No it hasn’t been hardy up here. But as I mentioned in response to another comment, I think it’s worth growing as an annual; same for ‘Limerock Ruby’, which I adore but can hardly find anymore. 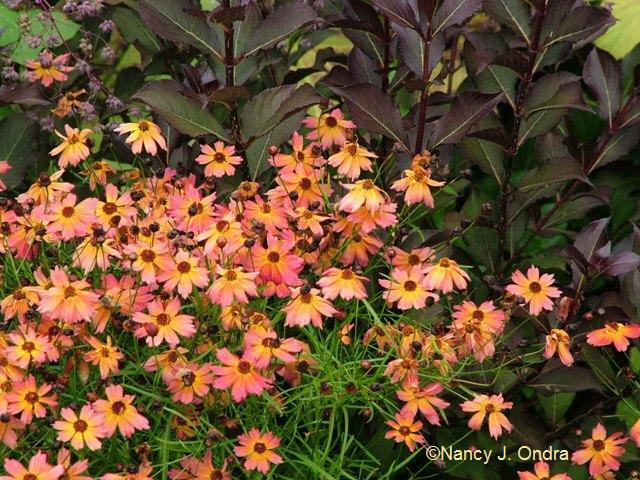 There is another coreopsis something like ‘Limerock Dream’ that *was* hardy for us last winter – ‘Sienna Sunset’ – but it’s paler orange than ‘LD’ (kind of canteloupe orange instead of terra cotta). The hardiness is in its favor, though, and it’s a good-looking plant (dense growth and bright green foliage). What a wonderful photographer you are! You’re very kind, Xan. Thanks for visiting. Your photos are magnificent…especially those last two. I’m definitely taking notes for plant combinations, although I, too, find that serendipity is often the best design tool. Plants do seem to have a knack for creating lovely vignettes – at least when seen close up. It’s the bigger views that take a bit more effort on our part! Ow, that really stinks, Benjamin. Grrr. The hawks and the increasing red fox population are doing a good job in controlling them for me here, but in my previous garden, I sometimes had to resort to making domes or boxes of chicken wire or stiffer wire mesh to protect young clumps. If needed, I pinned them into place with short stakes. 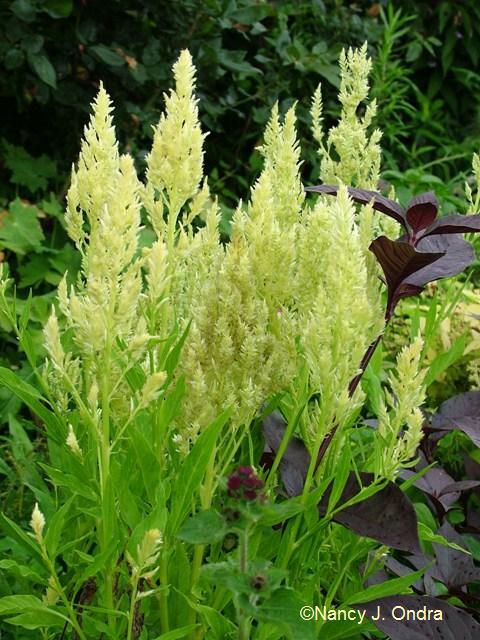 I’d usually take them off tall-growing plants in midsummer, once the plants seemed established enough to be safe. I let lower perennials grow right up through their cage, which served a double purpose of supporting the stems and preventing sprawling at bloom time. My first time visiting here. Read about your new book on May Dreams Gardens. Carol highly recommends it. You had a very colorful August GBBD. Lovely. Welcome, Donna. I’m so glad you stopped by to visit. Thanks for your kind comment! I’m not sure why I’m always surprised at the stunning combos you have. I should be prepared for them by now! But boy, some of them are truly breathtaking. I’m beginning to think that Pennsylvania is quite the mecca for gardeners after visiting Chanticleer this summer. Thanks once again for sharing your wonderful garden. How kind, Jean! And you’re right: We really are lucky to have Chanticleer and so many other glorious gardens in southeastern PA.
Good to see you here, Teresa. Thanks for reading! Hi Nan, I found your blog through Linda at Each Little World. She mentioned your garden on the post “Naming Gardens”. I as well, read too much as a child, but it was when I lived in England for a few years that I really decided to name my garden as well. I now have names for all the various sections, very useful for my husband to track me down. Great blog, and lovely photographs, I will be back. Welcome! How great to have a new reader. And absolutely, you need names for the various parts of your property for communication purposes. I have a big planting out front that I think of as “The I’m-Going-to-Die Border,” because that’s all that was going through my mind when prepping and planting it during a hot spell in mid-June one year. Mom, however, somehow changed the name to “The To-Die-For Border,” which kind of works too, when it looks really good. Either way, we both know where we mean. Well, you are certainly reconciling me to celosia, which has never been a favorite plant of mine, Yours are interesting and lovely, however. Thanks, Elizabeth. I guess it’s good that I didn’t show the cockscomb types. I had great luck with them as a kid but now can’t grow a decent-looking one, though I keep trying. I’ve followed your site for a while. Your blogs always give me ideas. I love playing with colors of foliage and enjoyed your blog on two colors of mustard, which I tried. That same ideas of chartreuse and purple is inspiring my lettuce bed for the fall. I’ve had to curb my budget this year and not get any more garden books, but one of yours is on my list when the time comes. Hi Mary Delle! I’m happy you left me a note (sorry it took me so long to respond) and that you found some useful ideas. If you can’t afford new books, there’s always the library, right? That way you can get a really good look and see if they’re worth buying when your budget allows. Your pictures are lovely and your blog is lively! Have you heard about Renee’s 2009 Photo Contest? If you’re interested in entering, the deadline is September 15th, 2009. Every entry gets a free packet of seeds. http://reneesgarden.com/Email/2009/7-09-hm.htm#contest Details are in our August newsletter posted at this link. Thanks for the reminder, Nellie! I’ve been shooting pictures all summer of some of the lovely annuals we have at work this year thanks to Renee’s generous offering of trial seeds. I am glad I found your blog! I am very impressed and absolutely charmed by your blooms. Thank you! Great to see you here as well as at GGW, Tatyana. Thanks for visiting!